This sound usually means trouble for your plumbing. Gurgling indicates that the water in your system is trying to move around a blockage. If you hear gurgling while your dishwasher is running, please call us. There are many different places for there to be a clog, and we can help you find it. If you open up your dishwasher and find a little bit of water, that’s not the end of the world. If you open up your dishwasher and water comes pouring out, that’s a problem. There could be food or particles that are blocking the drain, or it could be something worse. If you can’t see the immediate reason why it’s not draining, please call us. If you open up your dishwasher after it has run and find food still on your plates that usually means that water did not get into your dishwasher. That could be a clog in the main line or your secondary line. Either way, its best to call us so that we can help get those dishes clean! And no, not by washing the dishes, but we will fix your dishwasher. We’ve probably all seen some water backing up into the sink while running the dishwasher. This could be something entirely harmless, and you need to turn on your garbage disposal. But if that doesn’t fix it, then you should probably call us. We can diagnose the real issue and fix it for a price that won’t break the bank. 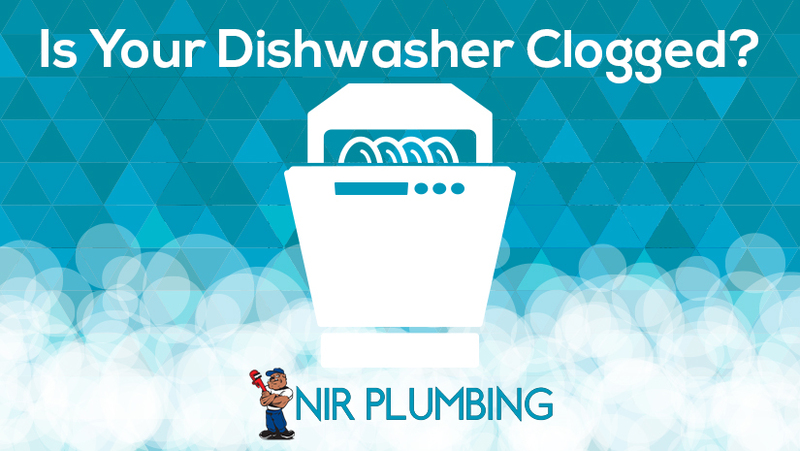 If you have any of these issues popping up with your dishwasher, please make sure to call NIR Plumbing today.